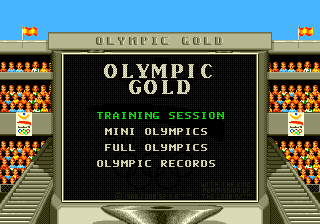 Olympic Gold (オリンピックゴールド) or Olympic Gold: Barcelona '92 is a Sega Mega Drive, Sega Master System and Sega Game Gear sports game that ties in with the 1992 Olympic Games held at Barcelona, Spain. Some versions of the game came with a free souvenir booklet. The US and Japanese versions of the Mega Drive game use the flag of the United States for the "English" language selection, while in Europe it is the flag of the United Kingdom. In PAL regions the game was also sponsored by Coca-Cola. Main article: Olympic Gold/Magazine articles. Main article: Olympic Gold/Promotional material.